High standard bungalows and the location of the site is next to the lake. This luxurious mobile home is suitable for 5 people. It has two bedrooms, two bathrooms and two separate toilets. The total living space is 48m² including a wooden patio with overhead sun shades. Want to rent a Mobile home? The SunLodge Redwood is perfect for you! This SunLodge offers space for 5 people and ensures ultimate comfort thanks to its two bathrooms and two separate toilets! That really is luxury camping (glamping)! A good night’s sleep has of course been taken into consideration. Extra large beds, extra deep mattresses and luxurious bed linen. A holiday at a campsite has never been so relaxing and stylish. Sunlodge has turned the mobile home into a holiday home. 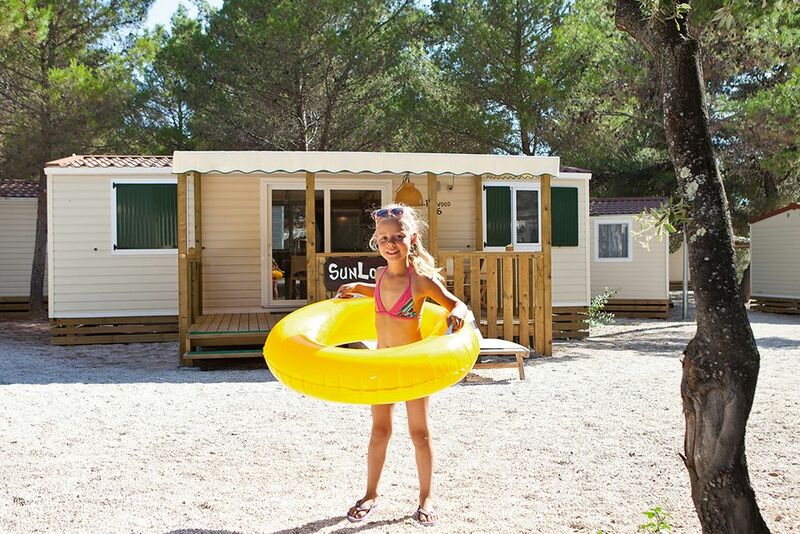 SunLodge Redwood can be booked at selected campsites in the Netherlands, campsites in Croatia (Istria), campsites in Italy (Tuscany, around Lake Garda and on the Adriatic) and campsites in the South of France (on the Mediterranean Sea). * Upon payment, only at campsites where ‘Rental television’ is shown in the accommodation price list. Use of the TV is included in the price at Stoetenslagh and Ter Spegelt campsites. Be aware that at most campsites there is little to no television reception. The TV is mostly suitable for viewing DVDs or playing videogames. ** Select a campsite and click by SunLodge Redwood on ‘Other information’. *** For an extra fee. The air conditioning is free of charge, except at the following campsites: Village Baia Blu La Tortuga, Centro Vacanze Isuledda, Village Cavallino, Mare Pineta Baia Sistiana en Poljana.